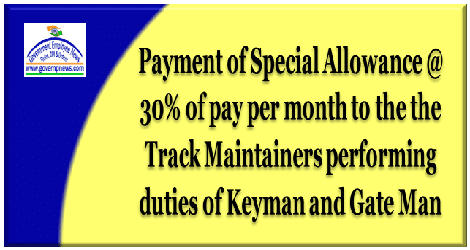 Sub: Payment of Special Allowance to the Track Maintainers performing the duties of Keyman and Gate Man-reg. The job of Keyman is toughest as he has to walk not less than 12 kms to perform his duty daily in all weather conditions. He has to minutely observe to detect the defects in track and evaluate safe/unsafe condition of track and accordingly take safety precautions to ensure safe running of train. He should be always alert to save himself from getting run over from train. After completing foot to foot inspection in first half, he is assigned to attend track in second half. He also supervises the gang work one day in a week or whenever Gang Mate is on leave. (a) Beat of Keyman in non PSC track = 6.00 km. (b) (i) Beat of Keyman in corrosion area = 4.50 km. (ii) Beat of Keyman in combined area = 6.00 km. If gang beat is more than 6.0 km in Non PSC track or in PSC sleeper track in combined area or 4.5 km in locations where the entire gang beat is in “corrosion area” then additional Keyman shall have to be provided. 2. Further to above, Federation also places below the duties performed by the Gate Keepers/Gate Man of Civil Engineering Department. Gate Keeper is expected to man the Level Crossing Gates in the mid-section and ensure free flow of train services without interruption. He should be on alertness and be prepared to take immediate action, should danger be apprehended. The Level Crossings are located at remote places. The Gate Keepers have to walk from their residence to the place of work to perform duties. Train passage is made smooth and intact. During train passing, shall attract the attention of the Loco Pilot. The duty hours at majority of gates have been classified as 12 hours a day. Gate Keepers have no transport facilities to return home after performing duties. Gate Keepers have to inter-act with Station Masters over phone about movement of trains for performing gate operations. They have to exchange private numbers with the station masters for passage of trains in the section. After closing the gate and lowering the signals for approaching trains, the Gate Keepers control the road traffic till complete passage of train. There have been occasions when the Gate Keepers have been attacked by road users when the gate is closed for smooth passage of train services. The Gate Keepers are expected to remove the vegetations and foreign bodies lying on the track. They face attacks from anti-social elements in the course of performance of duties. They cannot have the facility of regular food, drinking water and medical assistance due to being positioned at remote places. 3. The Task Force on safety has considered the duties and responsibilities of Keyman and Gate Keepers and recommended for grant of Special Allowance equivalent to 30% of Pay per month. The Railway Board has considered the recommendation of Task Force in its meeting held on 8th December, 2017 and agreed in principle for payment of Special Allowance at 30% of Pay per month to Keyman and Gate Man Civil Engineering Department in the Railways. NFIR, therefore, requests the Railway Board (ME & MS) to kindly arrange to see that action is taken for according approval for payment of Special Allowance @ 30% of pay per month to the Keyman and Gate Man of Civil Engineering Department. Provision of additional Keyman may also be considered in terms of suggestion made by the CTEs Conference held at Pune from 14th to 16th September, 2015. Federation may kindly be replied of action being taken on this communication.